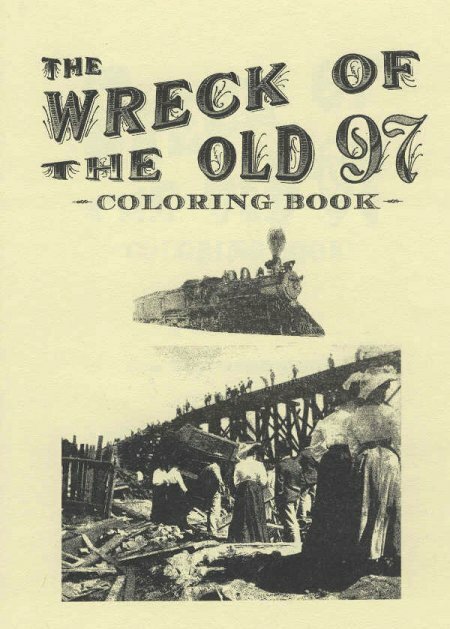 My grandfather Mark Daniel Jones (1878-1946) told his children many times that he was the thrid person to arrive at the wreck site of the “Old 97” fast mail train on September 27, 1903. Dan and his pregnant wife (my mother was born November 12, 1903) Annie Brooks Pruett Jones (1880-1969) were taking a nap on that Sunday afternoon. They were staying with Annie’s widowed mother Laura Lavelette Driskill Pruett at her home at 501 Middle Street. 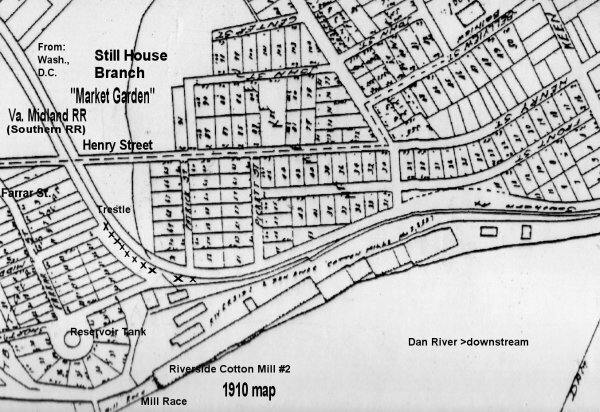 In the spring of 1904, Dan, Annie and my four-month-old mother Annie Marie Jones, moved to a 35-acre farm which they bought on Westover Drive just above the Jewish Cemetery. I believe that it included what is no the main Post Office on Teal Court. In 1908, they bought a house just outside of Danville in Pittsylvania County. That’s my grandfather Dan Jones house in the background. He and Annie bought four lots with this old house at the corner of Washington and Aspen Streets in 1908. In 1904, Dan (1878-1946) and Annie Jones (1880-1969) bought 35 acres on Westover Drive (where the present Post Office is on Teal Court). They sold the farm and moved to Washington Street (just a hundred yards into Pittsylvania County). The city annexed this area in 1931. All five of us Ricketts were born in the county. That is yours truly Danny on the poney. This was probably my first ride, i would think. 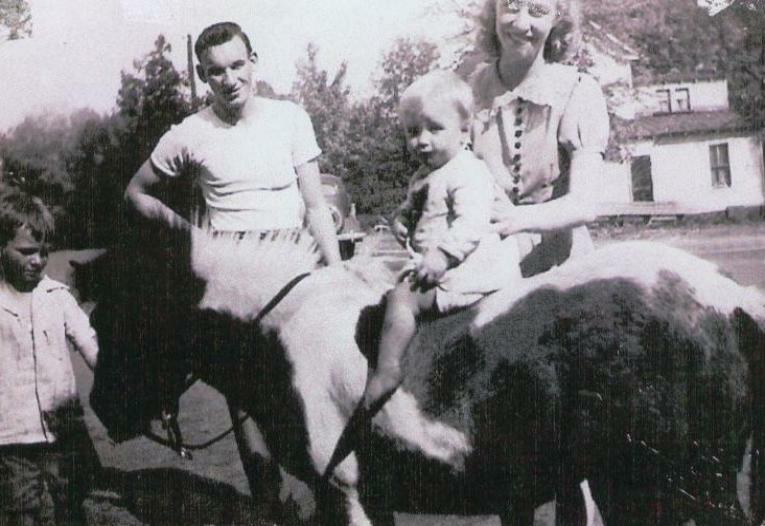 My sister Idella and James Lynch married in January of 1942 when I was one year old. This is about that time; maybe a little before or after. This is a detail of a wreck picture which was in the Jones family trunk. Dan pointed himself out to his family in the picture he bought shortly after the wreck. 25-year-old Dan Jones is at left. Next to him is the sheriff with his badge and billie stick. Idella died on August 10, 2008 at the age of 84. This is the complete photograph which Dan saved. This is an early photograph showing the last car which is almost entirely undamaged. 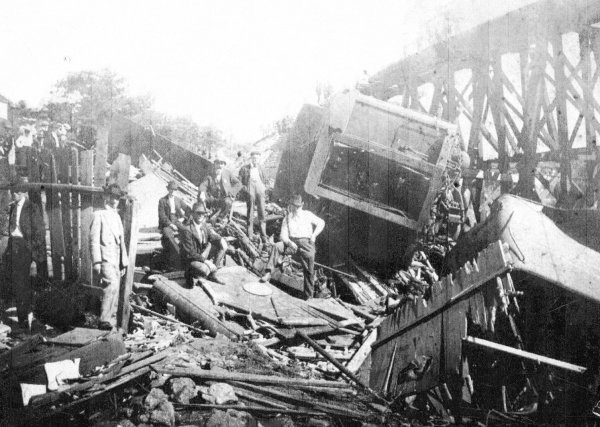 The railroad allowed nearby residents to take the wood from the wreckage. This also helped railroad officials reach the engine which was underneath this rubble. Dan heard the long continious steam whistle of the train which was coming down the distant hill. He told Annie that something was wrong. He stepped out of a low window and starting running towards the tracks which were about four blocks away. After running down John St. (now Richmond Ave.) one block, he was crossing Claiborne St. when he saw a cloud of dust rise and hear the rumbling crash. The noiese lasted a while when the cars crushed on top of one another. Another thing that Dan told anyone who would listen was that when they tried to pull some of the bodies out of the wreckage, the skin peeled off of their bones. The engineer Joseph Andrew “Steve” Broady, age 33, and others were scalded to death by the steam. “It’s a mighty rough road from Lynchburg to Danville and Lima’s on a three mile grade. It was on that grade that he lost his air brake; and you see what a jump he made.” These are words from the famous song which was recorded in 1924 and became the first country song to sell a million copies. Great Christmas for a Railroad collector and only $5. 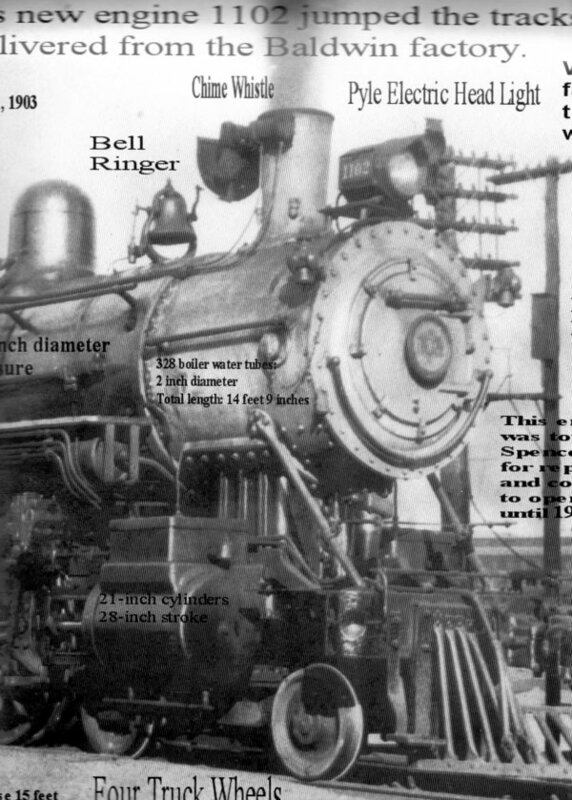 The engine was delivered to Souther Railway on August 21, 1903 from the Baldwin factory in Philidelphia, Pennsylvania. The practically new engine was towed to the shops at Salisbury, North Carolina and restored to service. It was scrapped in 1930. 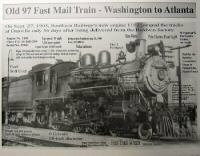 97 was a time slot for the southbound mail train in 1903; like a flight number today. 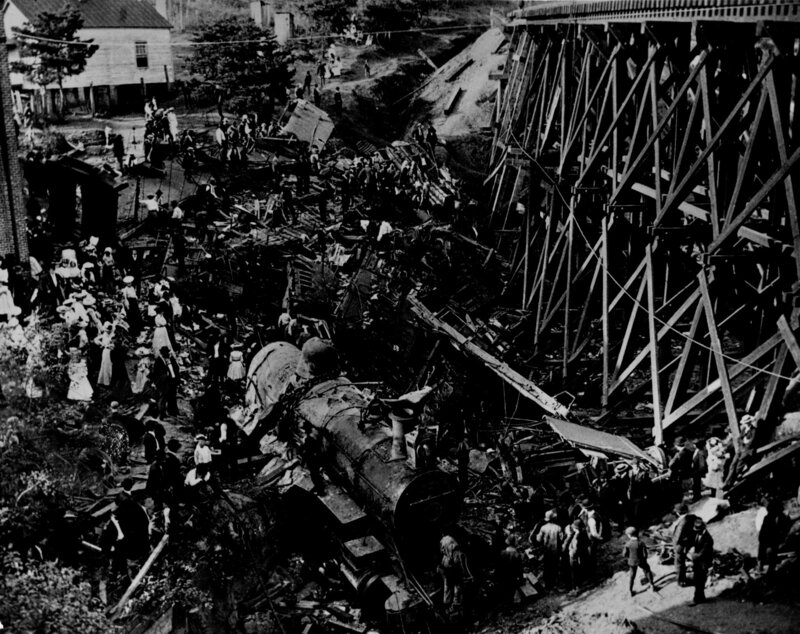 Some reports say that a flange on one of the wheels of the engine broke and caused the entire train to derail just short of the trestle. This photograph shows fresh dirt and scattered railroad ties west of the track and north of the trestle. It appears to me that the engine ran down the embankment and crashed into the mud of Still House Branch. The cars followed and piled on top. The damage to the car which ended on top of the heap was damaged. If it had fallen from the 45-foot trestle, it too would have been crushed. This appears to be the path taken by the train from a point north of the Still House Trestle. Note the fresh dirt and scattered railroad ties. This is the entire photograph from which the above detail is taken. This is after much of the rubble has been removed and the engine has been uprighted by chains. 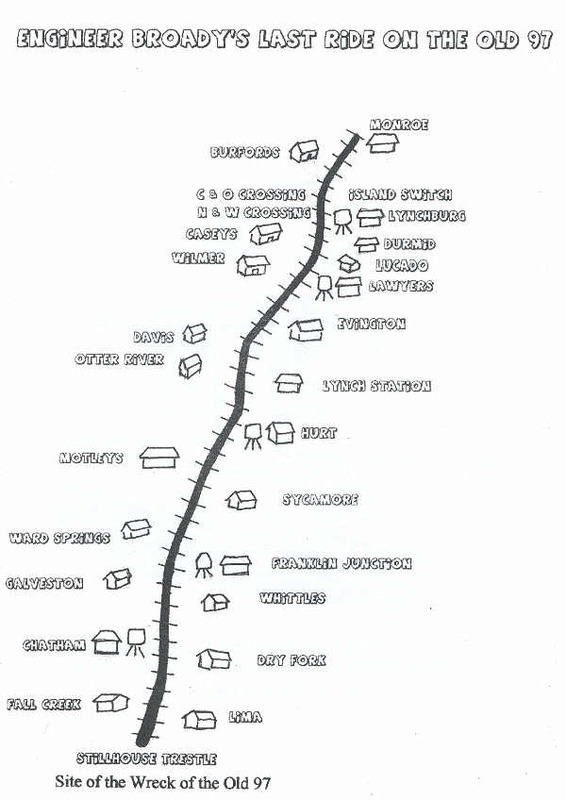 A temporary spur line was constructed to connect with the nearby track to a coal dump for the nearby Riverside Cotton Mills. 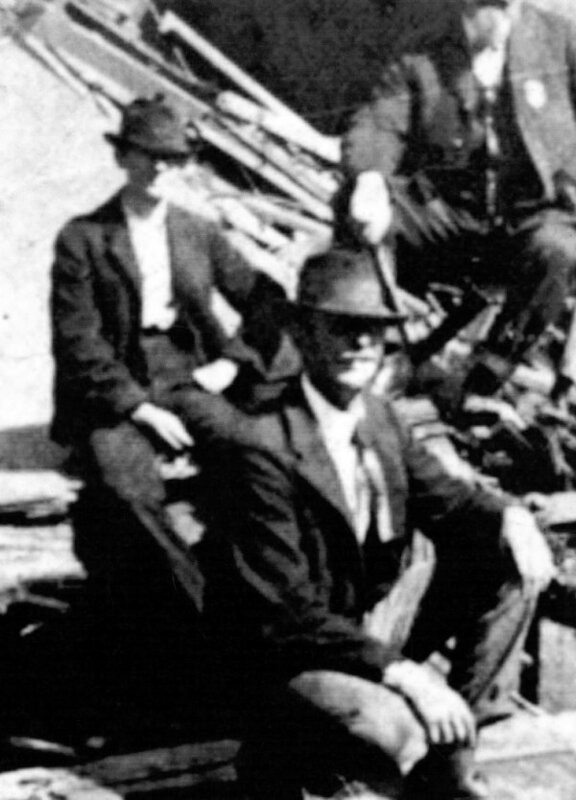 Dan Jones, my grandfather, came from Grit, near Staunton River in northern Pittsylvania County in 1889 with his mother after his father John Ellis Jones died. He was only eleven years old. A wooden platform was constructed for him so that he could reach the spinning frames. 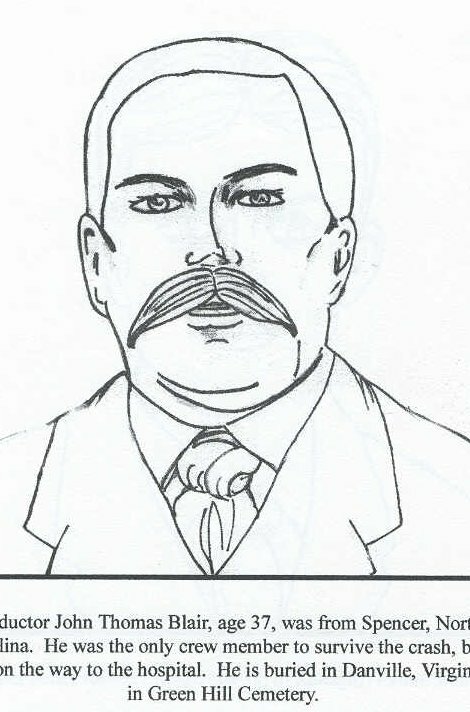 He later worked as a loom fixer and was with the cotton mill for most of his life. Wreck site in 1910. Note the trestle across Still Hose Branch. The nearby mill buildings are seen in some of the wreck photographs. Traveling along Henry St. there is a level place in the road which is the level of the downgrade from Lima three miles north to the trestle. The present US 58 highway is considerably higher than the heighth of the trestle. 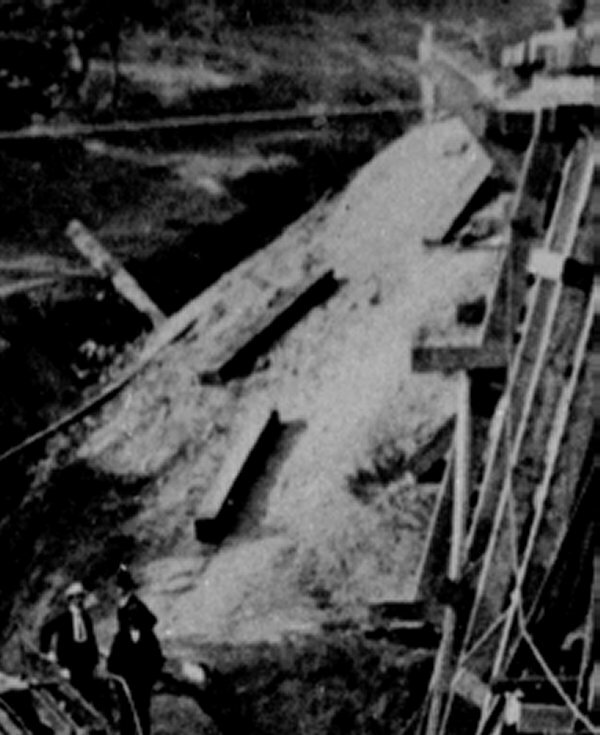 The trestle was dismantled in 1938. 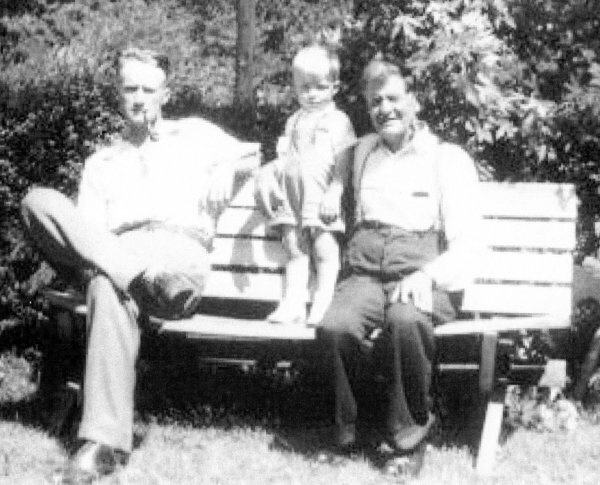 At right is Mark Daniel “Dan” Jones (1878-1946), Center is five-year-old Robert Daniel “Danny” Ricketts (b 1941), and at left is my father Reuben Edward Ricketts (1901-1957). Dan and his wife Annie gave my parents a lot next door, where they built a house in 1927. My uncle Austin Jones (b 1921)says that when he was a kid they had a wind up Victrola record player, but only one record. 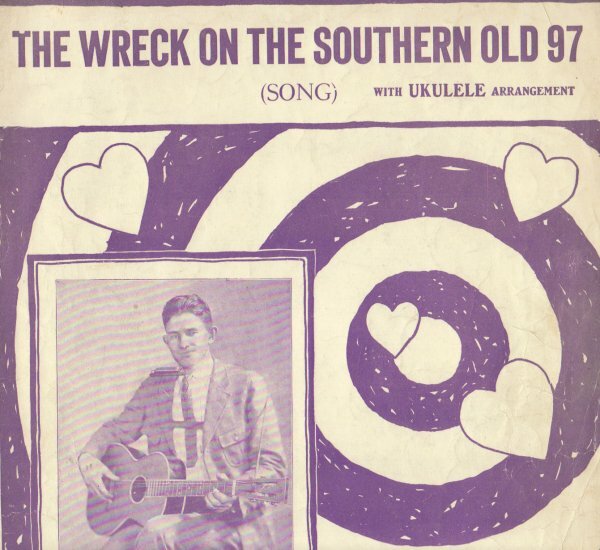 The record was “The Wreck of the Old 97.” The words and music of the first recording were copyrighted in 1924 by Henry Whitter. Then Vernon Dalhart (actually two towns in Texas, picked up by an opera singer who entered the country music field) recorded the song and it became wildly popular. Dalhart’s version became the first record to sell a million copies. Lots of money was made, so many came out of the woodwork claiming they had written the song. There was ten years of litigation which went to the Supreme Court several times. 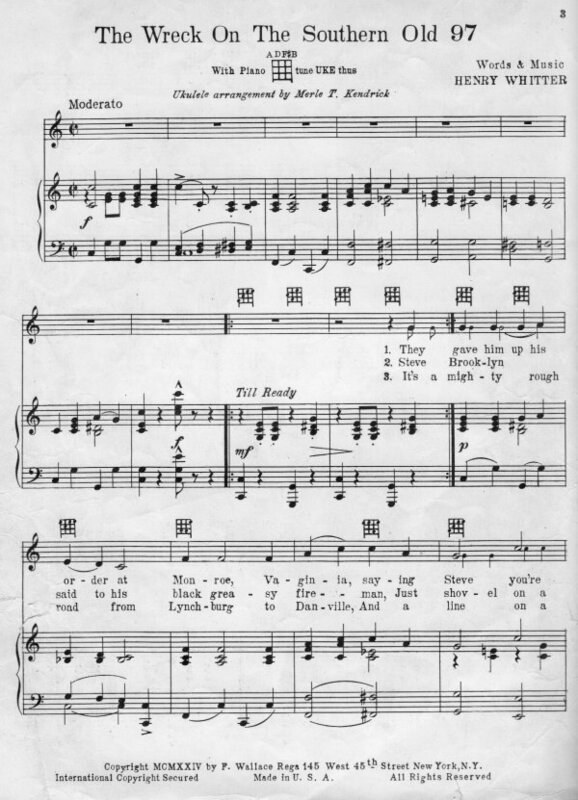 This is a page of my original copy of the 1924 sheet music by Whitter. The last line on this page is wrong. It should read “…And Lima’s on a three mile grade…” Lima was a freight station about three miles north of the trestle and wreck site. Express trains did not stop there. Lima was where the railroad tracks crosed the Franklin Turnpike, near the present Orphanage Road. Also, the song indicates that it was down hill from White Oak Mountain. The track descended from White Oak Mountain to Fall Creek Station. From there it was uphill to Lima, then the three mile downgrade to the Still House Trestle. 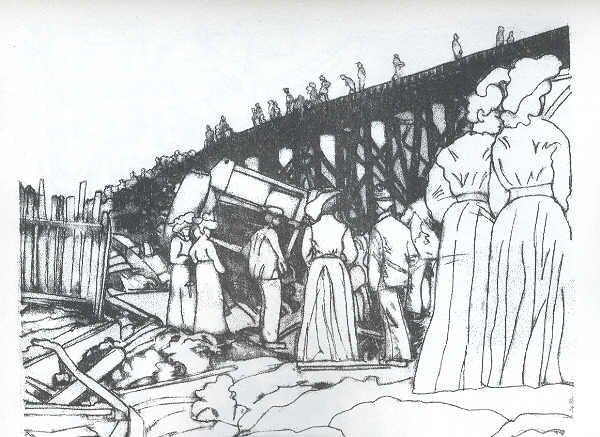 Ladies in their Sunday dresses gather at the wreck site (Coloring Book). Coloring Book by Nancye Ricketts, Cover design by Bobby Ricketts, copyright 2003, 32 pages (no printing on back side of drawings). 8 1/2″ x 11″. $3.50 local pickup. Priority shipping in U.S. $8.50. 102 Parrish Rd., Danville, VA 24540. Many other posters on Danville and Pittsylvania County, Virginia also available. This entry was posted on Wednesday, August 27th, 2008 at 8:14 pm and is filed under Uncategorized. You can follow any responses to this entry through the RSS 2.0 feed. You can leave a response, or trackback from your own site.